Delhi Metro on Thursday achieved another milestone when a brand-new train chugged into the satellite city of Noida for the first time paving the way for thousands of commuters in east Delhi and adjoining areas to enjoy the new age transport system. The 13.1 km Yamuna Bank-Noida line was inaugurated by Union Urban Development Minister S Jaipal Reddy in the presence of Chief Minister Sheila Dikshit at the newly-built Akshardham station here. 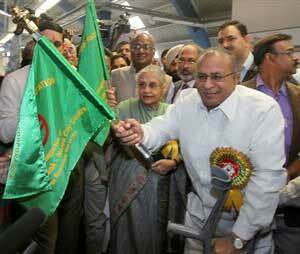 Reddy flagged off the first train with destination to Noida City Centre (Sector-32). This is the first time a Metro train formally enters Noida. The line, which will be opened for public from 6 am on Friday, is expected to bring a paradigm shift in the travelling habits of thousands of people in east Delhi and trans-Yamuna areas. The Noida corridor, built at a cost of Rs 630 crore, is completely elevated and will be integrated with the existing 34.3 km Yamuna Bank-Dwarka Sector-9 segment,extending total length of the Line-3 to 47.4 km. The line is also the first where the DMRC missed its deadline. The corridor was scheduled for opening in October. DMRC has projected that about 53,000 passengers daily are expected to join the new age transport system after the opening of the Noida corridor. The DMRC will run eight brand-new broad gauge trains, procured from Bombardier, on the line presently. Decks were cleared for the DMRC to cross Delhi and enter NCR in July when Parliament passed a Bill to give legal cover for construction, operation and maintenance of the metro rail system in the NCR and other metro cities. The Metro stations on the Noida corridor will have a completely new and modern look. Parking facility has been provided at all stations till New Ashok Nagar and in Noida at Botanical Garden and Noida City Centre stations. Akshardham station on the section will be one of the most aesthetic stations so far as it has been designed to match the look of the Akshardham Temple located nearby. The station will also be the tallest Metro station built so far, having six levels and standing 16.5 m above the ground and 21 m from the basement. Earlier, the Kashmere Gate station at 15 m above the ground was the tallest. In order to make sure that the station blends well with the locale which houses the sprawling Akshardham Temple, DMRC decided to use Dholpur stone on the exterior of the station structure as has been done in the temple too. Provision has also been made at the upper ground and concourse levels of the station for commuters to enjoy the magnificent view of the temple. The station will be connected to the Commonwealth Games Village by a road being constructed by the Delhi Development Authority (DDA) from the front entrance of the station. The DDA is also constructing a bus shelter near the front entrance of the station for the convenience of commuters using the public transport.